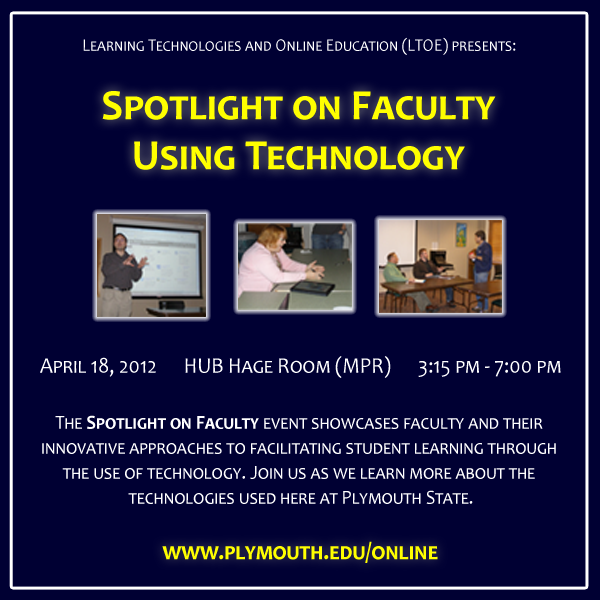 Learning Technologies and Online Education (LTOE) is proud to announce this year’s Spotlight on Faculty, to be held on Wednesday April 18, 2012. This popular event gives instructors a chance to present to their peers technologies they use at Plymouth State. Proposals are welcome on a variety of instructional technologies in the classroom, whether it be face to face, blended, or online. Proposals focusing on administrative, professional development, and research applications are also welcome. LTOE staff will be collecting proposals through Monday March 5, 2012 and will be contacting those selected to present at that time. Please contact a member of LTOE’s staff if you have any questions.